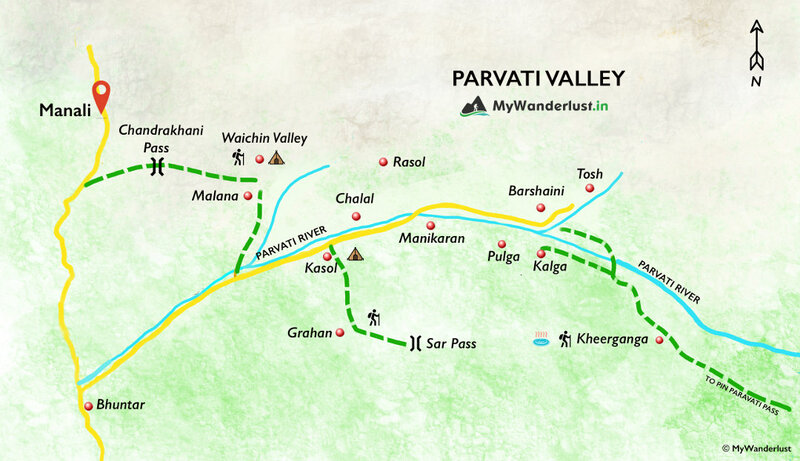 Kasol located at an altitude of 1581m in Parvati Valley, is by far one of the most favored places in Himachal by backpackers, trekkers and explorers in vast numbers. Kasol is a small village situated along the banks of the river Parvati on the way between Bhuntar and Manikaran, about 30 Kms away from Bhuntar, majorly populated by the Israelis. This place is more than just a destination set amidst the serene beauty of nature or a budget friendly hotbed for adventures. Well known for catering the best experience of trekking, rafting, camping, sightseeing, parties or be it in the spiritual awakening. For those who want to taste scrumptious Israeli food, there are several Israeli cafes and restaurants to please their taste buds. It never tends to dishearten those who come here for ultimate gratification. It is the best hub to take a get away from your regular busy schedule and get your next ultimate eternal experience in Kasol.